My wife Paulie and I moved from Windham Center to Mason’s Island in Mystic, Connecticut, and Gertrude came to the new digs with us. 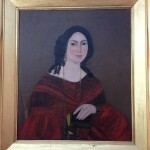 As she was considered part of our family, her portrait was placed in our great room that overlooked an inlet of Long Island Sound. It was a positon of honor. She seemed content and to have forgotten us. Unfortunately, we found that the home was in ill repair and in need of complete renovation. As a result, we embarked upon a yearlong restoration that resulted in stripping the home to its bare bones before rebuilding it. The wall from which Gertrude looked upon the water was slated to be knocked down, but because of her status, it was to be the last wall demolished. Paulie and I were living elsewhere although we frequently visited our Mystic home to monitor the progress of the renovations and to sit in lawn chairs in the great room and look out on the water. Only the framework of the home remained and electrical extension cords were the source of electricity. A lamp with a rheostat that provided a varying intensity of light was connected to an extension cord and was the only source of light in the home. One Saturday evening at dusk we were sitting in the great room with two close friends who had come to see what we were doing to our home. The lawn chairs, the lamp with the rheostat, and Gertrude’s portrait were the only furnishings left in the home. At the time, the lamp was turned off. Our friends asked what we intended to do with Gertrude’s portrait once the renovations were completed. We replied that Gertrude would always be given a place of honor in any home we lived in. At that moment, the lamp turned on and its light flared to its brightest extent and then turned off. We were stunned at the appropriateness of the flaring light relative to the asked and answered question. Needless to say, our friends became instant believers in the legend of Gertrude. As for the names I had been given in dreams, I found that Adrian van **** had a relationship with two women named Annatje. One was his sister and the other was his wife. Which Annatje had Gertrude given me? Had she given me both? The two, as well as Adrian, would have had interactions with Gertrude’s ancestors. As I mentioned in Gertrude Part II, members of Gertrude’s family married members of the van **** family. Having three people to investigate complicated the ancestry search. I planned to visit Schenectady and search the local records of the early Dutch inhabitants. I also thought I might hire the services of a professional ancestry researcher. I’m sorry to say I’ve done neither, although I intend to do both. In 2010 Paulie and I moved to Florida, and Gertrude came with us. Again, she was given a place of honor in our home. For the five years we lived there, she did not make her presence felt. In 2015 we returned to Connecticut and purchased a home in New Milford. Since returning to the northeast, I have heard footsteps on our stairs during the night that has me convinced they’re Gertrude’s. Also, I am a voracious reader, and at any given time I may be reading two to four books. I use paper clips to mark the places I want to come back to. Lately I’ve found that the paper clips have been moved and are not on the pages where I left them. Paulie says she’s not moving them. Is it Gertrude, happy to be back in Connecticut, letting us know that she’s still with us? I’ve told the story of what I’m convinced is a spirit that has come into the lives of my wife and me. Everything I’ve related is the unembellished truth as I know it. At one time I would have said belief in ghosts is bunk. Everything attributed to them has a logical explanation. Not now. Even if I were willing to concede that the interactions I’ve had with Gertrude are a figment of my imagination and that ghostly visions, furniture being moved, and lights turning on and off are a misinterpretation of natural phenomena, there is still something I cannot explain. I cannot dismiss the names of Adrian and Annatje van **** that came to me in dreams. They were real people who had relationships with Gertrude’s ancestors. Their names were as foreign to me as anything could be, and I could never have conceived them on my own. They are the reason I believe in Gertrude. If, as I have surmised, I have been contacted by the spirit of a woman who lived two hundred years ago, the ramifications are immense. It would mean that death is the end of the body, but the spirit or soul, as some might call it, continues. Perhaps an explanation may be found in science such as in the multi-universe concept of quantum physics. Perhaps the answer resides in religion. In the portrait of Gertrude she’s holding a book of psalms and hymns. It seems to indicate she was a devout person. I have the actual book and can say that it was well used and has handwritten notes in it. For example, there is a written reference to a hymn that deals with being vile and unrighteous and asking for forgiveness. On the back cover the word ‘primogeniture,’ the feudal right of succession by the eldest son, is found twice. It’s a word I find strange to be placed in such a text. As for me, I can sum things with a paraphrase of the speaker in Millay’s poem Renascence: I know not how such things can be, I only know what came to me.